This explanation about the difference between hunger, real need of food, and appetite, just a desire for food, has been extracted from “The Life Science Health System” by T.C. Fry. “Hunger is the great safeguard of all life. It impels the organism in need of food to search for and procure food. It may be safely inferred that if there is no hunger, there is no need for nourishment. Hunger is a normal expression of a physiological need and when it is absent, we may take it for granted that the physiological need that gives rise to it is also absent. When hunger is absent, therefore, no food should be taken. We use to mistake the morbid sensations of a food-drunkard for the normal expressions of life. Real hunger, rather than producing lassitude and drowsiness, or faintness, produces alertness and activity in the search for food. The feeling of emptiness, and the gnawing are not symptoms of hunger. Neither it is a feeling of weakness, headache, or nausea. These are morbid sensations representing gastric irritation, a neurosis, gastric ulcer, indigestion, gastric catarrh, reaction from withdrawal of stimulation, etc., rather than hunger. That faint sinking feeling at the pit of the stomach, with a morbid craving for something to eat, is due to catarrhal inflammation of the lining membrane of the stomach. Such symptoms of gnawing and faintness are seen in their height in cases of acute gastritis as well as in gastric ulcer. Indeed, a bowel movement may induce them in cases of colitis. How often we see people who are always eating and who complain that they are always hungry. They eat several times a day and three or more times at night, but they never seem to get enough to eat. Of course, these people are never hungry; they are food drunkards who employ food as palliation. Eating temporarily “relieves” their gastric and nervous distress. They are merely extreme cases of what physiologists mistake for hunger. The sense of all goneness in these cases is not from a lack of nutrient material, but owing to the absence of the habitual stimulus. If left alone these morbid sensations sooner or later pass away, but if palliated by eating or or by drink; they are but temporarily smothered. As soon as the stomach is again empty of food, they are back again, perhaps with renewed intensity. It is true that eating will allay these sensations, just as a shot of morphine will relieve the morphine addict, and there is just as much sense in taking food in the first instance as there is in taking the morphine in the last. True hunger is felt in the mouth and throat and is related to the senses of taste and smell. it is indicated by a watering of the mouth for plain food, for any kind of food. True hunger is a mouth and throat sensation rather than a stomach sensation. It’s similar to thirst. Thirst if felt in the mouth and throat and there is a distinct and conscious desire for water. 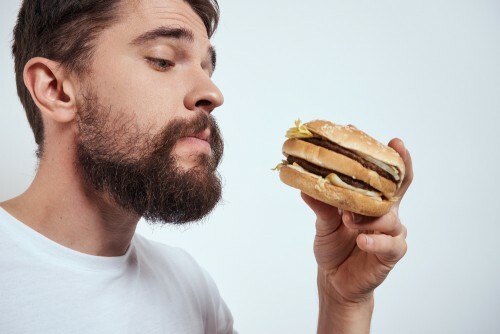 In this other article you will find more information about the cause of cravings, food addiction and overeating, as well as some tips to overcome these food-related disorders.